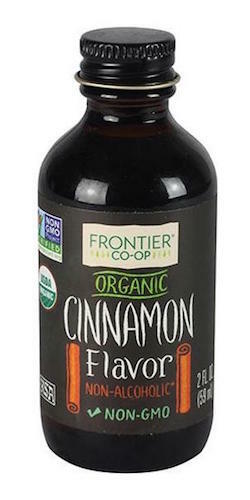 Frontier Natural Products Organic Cinnamon Flavoring 2 oz. Organic Cinnamon Flavor provides the warmth of cinnamon in baked treats, batters and simmering potpourris. Mix a few drops into cookie, cake, waffle or pancake batter, and in icings. For a relaxing potpourri, add to a quart of simmering water, along with cloves and cinnamon sticks. Ingredients: organic sunflower oil, cinnamon oil.